Today’s featured plant is Prickly Wild Lettuce, Lactuca serriola. 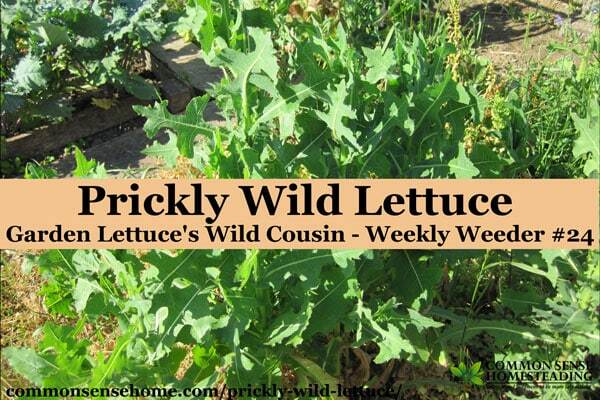 Prickly Wild Lettuce is also known as opium lettuce, wild lettuce, wild opium, horse thistle, China lettuce and prickly lettuce. Its medicinal properties are similar to Lactuca virosa, which is also known as wild lettuce. You can find wild lettuce mostly in disturbed soils, such as vacant lots, along roadsides, in dumps and other waste areas. Lactuca Serriola prefers full sun and tolerates dry soils. Survival, Tracking and Awareness of Australia has some great photos showing exactly how durable this plant is. The plant is an annual or biennial, growing 2-7′ tall. Leaves are attached in an alternating pattern to a central stalk, and are up to 12 inches long and 4 inches across. They are simple lobed leaves, getting smaller as they move up the plant. Wild prickly lettuce has a distinctive line of spines or prickles on the underside of the leaves, running up the midvein. The leaves themselves are slightly prickly, mainly underneath. They can be handled without significant discomfort – they only poke a bit. Once dried, they are more prickly. Prickly wild lettuce blooms from mid-summer to fall. Flowers are small and yellow, about 1/3″ across and 1/2″ in length – somewhat like a skimpy dandelion flower. Flowers have between 5 and 20 toothed petals. Multiple flowers are produced on each plant, and an individual plant can stay in bloom for about a month. The plants produce a white, milky sap. Prickly wild lettuce is similar in appearance to perennial sowthistle. The primary differences are the line of midvein spines on the underside of the prickly wild lettuce leaf, and the flowers. Sowthistle flowers are fuller and more like dandelion flowers in appearance. Prickly wild lettuce flowers are somewhat skimpy looking by comparison. Wild lettuce also has a taproot like a dandelion, whereas sowthistle has a system of runners – more like quackgrass. Weeds – Control Without Poisons notes that chickens and pigs both relish wild lettuce as a green. The bitter flavor comes through in milk, so it's best to eliminate it from dairy pasture if possible. 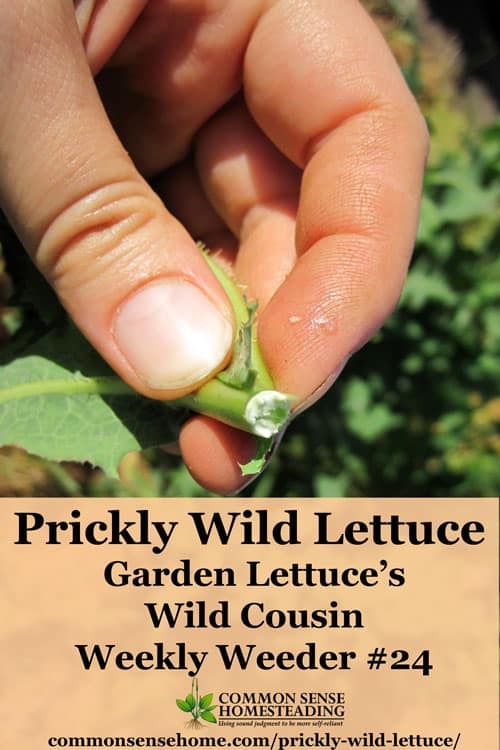 Is Prickly Wild Lettuce Edible? These plants are the ancestors of garden lettuce, and the young leaves are bitter but edible. Eat leaves raw or cooked. As the plants mature, the bitterness becomes more pronounced and they get downright unpleasant to eat. Dry conditions also make the leaves more bitter. (This is similar to dandelion leaves.) The texture of the leaves is similar to spinach or a hardy lettuce (with prickles), so excess cooking will make the leaves very mushy. Plants for a Future shares that the young stems can be cooked and used as an asparagus substitute, and the seeds can be refined to produce an edible oil. The oil is also used in soap making, paints, and varnishes. The whole plant is rich in a milky sap that flows freely from any wounds. This hardens and dries when in contact with the air. The sap contains “lactucarium”, which is used in medicine for its anodyne, antispasmodic, digestive, diuretic, hypnotic, narcotic and sedative properties. Lactucarium has the effects of a feeble opium, but without its tendency to cause digestive upsets, nor is it addictive. It is taken internally in the treatment of insomnia, anxiety, neuroses, hyperactivity in children, dry coughs, whooping cough, rheumatic pain etc. Concentrations of lactucarium are low in young plants and most concentrated when the plant comes into flower. It is collected commercially by cutting the heads of the plants and scraping the juice into china vessels several times a day until the plant is exhausted. This species does not contain as much lactucarium as L. virosa. An infusion of the fresh or dried flowering plant can also be used. The plant should be used with caution, and never without the supervision of a skilled practitioner. Even normal doses can cause drowsiness whilst excess causes restlessness and overdoses can cause death through cardiac paralysis. The fixed oil from the seeds is said to possess antipyretic and hypnotic properties. A homeopathic remedy is made from the plant. It is used in the treatment of chronic catarrh, coughs, swollen liver, flatulence and ailments of the urinary tract. The Holistic Herbal suggests pouring one cup of boiling water over 1-2 teaspoons of the dried leaves of Lactuca virosa and allowing them to infuse for 10-15 minutes. (Lactuca virosa has similar but more concentrated medicinal properties.) This infusion can then be consumed up to three times daily. When we were clearing out one of the garden beds, I harvested enough to fill up the dehydrator. I let it dry overnight at low temp (95F) until crisp, and then stored it in a tightly sealed canning jar for later use. As noted above, use with caution. I have herbal training and feel confident in using it in small doses. Always check with your doctor before using any herbal preparation, especially if you have a known medical condition and/or are on any prescription medication. Do not use if you are nursing or pregnant. Any medical information on this website is for informational purposes only. Exercise caution when using any wild plants and make sure you have positively identified the plant. In The Gardener's Weed Book, Barbara Pleasant notes that the best control methods are those that catch wild prickly lettuce when it's young. Like dandelions, it spreads many seeds, so catch it before it flowers out. It has a taproot, again, like a dandelion, so cut young plants just below the surface with a scuffle hoe. Older plants, like dandelions, will resprout from root stumps. Heavy mulch will smother plants. (Wild prickly lettuce will be found where there are) low aerobic activity, hardpans, crusted soil, low pH, etc. Calcium is always too low when prickly lettuce arrives. Magnesium is high, as is potassium. 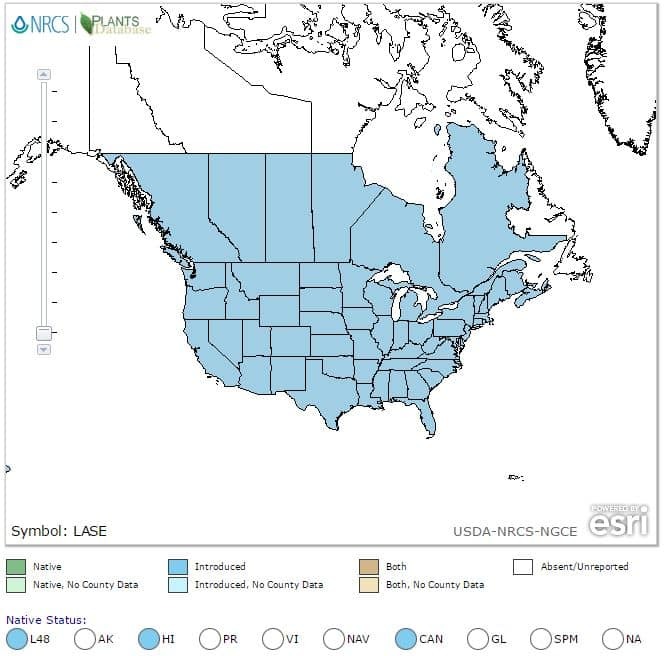 High manganese and iron releases also figure. So – work to aerate your soil and improve the amount of organic matter, and considering liming the soil to improve calcium levels. The Herbal Academy offers many excellent courses and resources for those who would like more detailed plant use information, including their herbal fermentation course linked below. What about all the spiney parts? It looks like Urtica dioca… have you ever eaten it raw before? I know with nettles the stingers go away with light cooking, but what about this guy? Savannah – the spines aren’t nearly as pokey as nettle, and they’re mainly concentrated along the center rib, which can be easily removed if needed. I have eaten some young leaves raw, and it doesn’t irritate the mouth like nettle – it’s just bitter, like a strongly flavored garden lettuce. Hi! Thanks so much for featuring my post on 100 things you can compost! This week I posted on saving tons of money on electricity over time, and my recipe for coconut water kefir–a healthy alternative to soda. Dawn – I enjoyed your post, and will also be sharing it on the Common Sense Homesteading facebook page. Prickly Lettuce, prior to flowering, is browsed by Mule Deer here in the Southern Black Hills, Hot Springs, South Dakota. this post is good. We should stop using non selective herbicides so as to save some of these important plants. YES! We need to limit herbicides period! They are causing cancers, epilepsy, birth defects, autism in children and all kinds of health problems. They are deadly. The only kind of “weed control” should be something organic. NOT chemical. BAN Monsanto!!! The “medicinal” properties of this plant can be equally potent to that of the poppy. It must be used correctly however..
Take 1-4 leaves (2 is pretty strong for me) from the upper part of a mature plant, right before flower if possible, and also even better during a drought. Chew up a leaf slightly then place under the tongue, let it sit while occasionally spitting out the juices. (Swallowing juices too much can lead to purgative effects.). Continue slight chewing here n there to release the milky sap then repeat with another leaf or two. Be careful as it can be a potent substance with sedation so strong and long lasting it can cause vertigo and nausea. (Talking from experience here.) Start low but a very useful alternative to expensive pharmaceuticals or over the counter sleep aids considering it grows everywhere. Thanks for sharing your experience. Note to anyone who may try this, those leaves will be *very* bitter. Would you use for back pain. My son has sciatic nerve pain that can put him down for weeks if he lifts anything the wrong way or even at times turn too fast. He is against modern medicine all together due to the addiction properties associated with them. I have a disc disease that I struggle with. I’m working on making our meds from what our Holy Father gave us to use for our bodies. Not to mention making sure I can help others in the event of things going bad as could be any day. Please respond. You can pm me too. It’s not safe or legal for me to diagnose or treat a specific illness over the internet. The herb has historically been used for pain relief. I’ve read that the seeds can be ‘processed’ to make an oil for pain. But how is not mentioned. I need more information. Seed oils are typically made with a seed oil press, but I don’t know if they would work with seeds this tiny. This is an example an oil press on amazon – Piteba Nut and Seed Oil Expeller Oil press. Please understand that since the plant is a mild opiate, I can’t give specific directions for anything that might be used inappropriately. I have been drying and eating two leaves at a time for chronic migraines and sometimes it works. Eating them dried escapes the bitterness. I have the exact same problem as your son and I have had very good results from wild lettuce tincture and almost zero results from CBD oil. The CBD oil makes me sleepy which is great if it’s bedtime but it doesn’t seem to do anything for the pain. 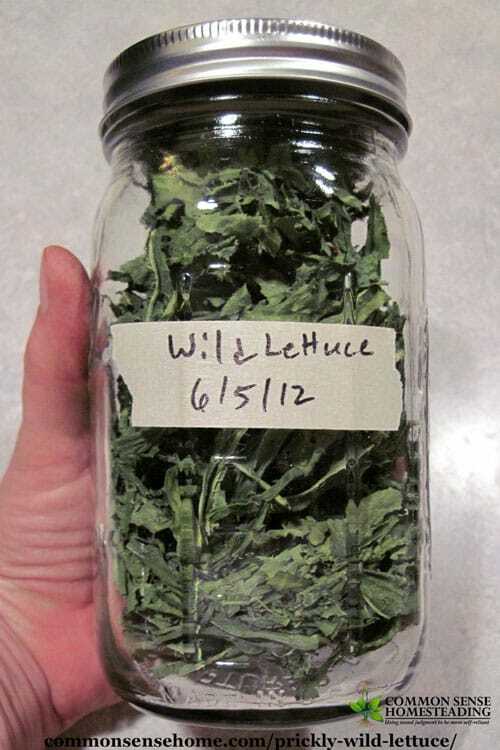 But wild lettuce tincture works almost instantly within 5 minutes of taking it and so I even ordered some wild lettuce seeds and I intended to grow my own. Excellent article! I was not aware that this common “garden menace” had such significant medicinal properties! I was skeptical at first, but tried a crude experiment last weekend to see if the claims had any truth to them. My experiment consisted of pulling a plant, breaking the stalk to let the latex bleed out, and repeating this 3 to 4 times per plant. The first time, I tried a single plant and after about 20 minutes, felt a very slight effect. I waited a few hours for it to wear off, and then tried the same thing with 2 plants. This time, I got a more pronounced opiate effect. I then waited a few more hours for it to wear off, and tried the same thing with 3 plants. I would say this time the effect was perhaps equal to a 7.5mg lortab – but it was also slightly sedating too, so maybe a combo of a lortab and shot of whisky. Be warned though, that latex tastes horrible! Possibly the most bitter thing I have ever tasted. Have a sweet drink with you, and be careful on dosing. Just like an opiate, overdosing on this can kill you. I forgot to include that after breaking the stalk, I licked the latex directly off the stem of the plant. Then repeat that 3 or 4 times per plant. And have a drink handy, preferably something sweet! I look forward to trying this common garden spot weed for pains that in the past I had been receiving strong opiates for pain control. Hey if helps with my chronic pain with mild side effects that would be great ! Since I no longer take opiates chronic pain can very much dictate your daily activities any natural medicinal plant is appealing. I was wanting to know the best way to handle picking and using Prickly Wild Lettuce. I see they have stickers on the tips of each leaf. The spines top and bottom are full of them. The roots looks like it has hundreds of stickers! I definitely plan to wear gloves to pick them. I pick up lots of wild lettuce when I go horseback riding. So easy to see at that level. I got to looking at my own property and it is loaded with the Prickly Lettuce. I noticed some starting to seed and I would love to grow all of the different species of it that I have been finding. It’s been a life saver for me when it comes to pain all over. Thank you Lord for this wonderful weed! I was wondering how do I make a tea? Do I dry out the who plant then boil it? How many plants do I boil? I have about 3 pkants that I up rooted and now an drying them out. Also how can I plant these to grow more? Pour a cup of boiling water on to 1-2 teaspoons of the dried leaves and let infuse (covered) for 10-15 minutes. Strain out leaves. Drink 3 times per day. If you pulled the plants up, they are dead, and cannot be used to grow more. In the future, if you would like to grow additional plants, allow them to flower and set seed. Harvest the dried seed heads and plant the seeds. I’m a new student(self-teaching) to the use of natural medicines and food sources. I would like to thank you for this information but I would like to ask a question. Will this work in tincture form? With brandy? It would seem easier for me to control the dosage if this is possible. Would there be a standard to go by concerning dosage amounts. If not I would likely start with two drops in a glass of water and increase carefully until I felt the effects that I would be needing. I have RA and I wake sometimes in the night with restless legs and anxiety with some occasional neck and jaw pain. I refuse to take prescription drugs due to the side affects and costs. Yes, the plant can be tinctured. Dosage will vary depending on the strength of the tincture, and there’s no easy way to home test potency, so there would be no easy way to set standards. Also, each individual is different. Do you use magnesium supplementation? Several of the symptoms you mention are commonly helped by magnesium, orally and topically. The Magnesium Miracle is an excellent read on the topic. How can I tell the difference between wild lettuce and sow thistle? Do they both have the same properties? Sow thistle roots are long runners, but very brittle. They like to break into pieces as you pull them up, and each piece grows into a new plant. Sonchus oleraceus (sow thistle) is commonly used as a fodder. It is also used to treat a wide variety of infections. Sonchus oleraceus used in the treatment of headaches, general pain, diarrhea, menstrual problems, fever, hepatitis, salmonella infection, wars, eye problems, liver infections, infections, inflammation and rheumatism. Hi! Thank you so much for writing this very informative article. I was wondering what you would consider a small dose of the sap? Thank you! “Small” is a relative term, based on the individual. People are larger or smaller in size, and may have difference levels of tolerance to the active compounds. If someone were to attempt to take the sap internally, I’d start with a very small amount and increase slowly as needed, watching for any signs of problems. Always make sure to check with a trained healthcare provider if you are on any medications, and don’t experiment at all if nursing or pregnant.